It will have little economic effect but will add more bellicosity to a world already overdosing on it. The tariffs are right for Trump—nationalistic, truculent, bombastic—but people who cherish international solidarity and humane social policies should think again. They will do little if anything to help the steel industry, could harm steel-using industries, will probably provoke retaliations that will leave everyone worse off, and will add a fresh dose of bellicosity to a world already overdosing on it. It’s not clear how Trump imagines victory in this fight. 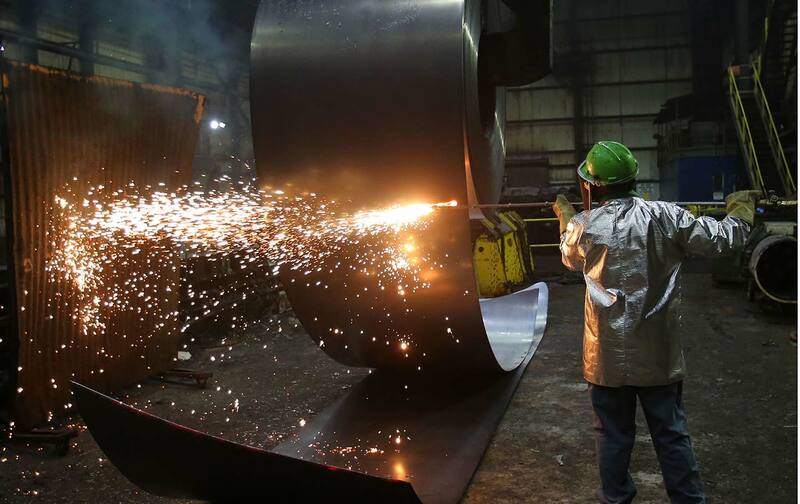 Let’s take a look at the economics of steel, an industry Trump equates with national greatness. If that’s the measure, American greatness has suffered from a long bear market. Back in 1958, the heart of an era that Trump seems to romanticize, steel accounted for less than 1 percent of total US employment. Twenty years later, 1978, it was down to 0.5 percent—and that’s before the accelerated deindustrialization of the 1980s brought us the term “Rust Belt.” It’s now under 0.1 percent. But it’s not like steel itself is disappearing. While steel employment is off 54 percent since 1990, the production of steel (by the Federal Reserve’s measure) is up 18 percent. Between 1990 and 2015 (the latest year available), productivity per hour of labor in the steel sector was up 151 percent. Labor’s share of value-added in the industry—the portion of the difference between revenues and costs of raw materials that’s paid out to workers—fell from 23 percent in 1990 to 13 percent in 2015. In other words, steel workers aren’t doing well, but the steel industry is doing OK. It’s not booming, but it’s solidly profitable. It’s hard to see how Trump’s tariffs are going to change this in any meaningful way. We have some recent experience with steel tariffs, the ones imposed by George W. Bush in March 2002. Bush lifted them in December 2003, under threat of retaliation by the EU, with another politically well-selected set of targets (Florida oranges, and Harleys again), and complaints by domestic steel users. During the 21 months they were in effect, steel employment fell by 9 percent, but production rose by 20 percent. There’s evidence that steel-using industries, like autos and appliances, took a mild hit from the resulting higher prices; a survey by the US International Trade Commission, an independent, quasi-judicial branch of the federal government, found higher steel prices, at least for a while, that were hard to pass along, and mildly increased difficulty in sourcing steel. Overall, the ITC estimated that the tariffs resulted in a “welfare loss” of $42 million, an almost immeasurably trivial amount by the standards of the US economy. Of course, the story could have been different had Bush not lifted the tariffs, and the retaliations escalated. It wouldn’t be surprising if Trump does the same; he’s already making exceptions—though it’s worrisome that he is now ordering his aides to prepare a fresh set of tariffs on Chinese goods. So the tariffs are likely to have little economic effect, though they do add to the political ugliness that’s the Trump regime’s stock in trade. But they demonstrate something curious about Trump’s political vision. Unlike earlier American presidents, Trump is not an apostle of a better world to come. There’s none of Clinton’s “Bridge to the 21st Century” or his annoying appropriation of Fleetwood Mac’s “Don’t stop thinking about tomorrow.” While a lot of that was campaign con artistry, there’s still something to be said for the outlook in general. Trump is more interested in building a bridge to 1958, when steel and coal were regarded as some kind of royalty. It would make more sense instead to develop an industrial future—one manufacturing the infrastructure of a clean energy and transportation system—in the abandoned parts of the Midwest and South, regions suffering from poverty, isolation, addiction, and early death. But that would take major amounts of public investment and planning, things that Trump and his party are profoundly opposed to. That’s what we should be pushing for, not cheering snake oil like metals tariffs.